NEW BRITAIN - Armani Hernandez takes a moment to collect his thoughts. He often doesn’t talk about it unless he’s asked. There’s no real reason to he figures. 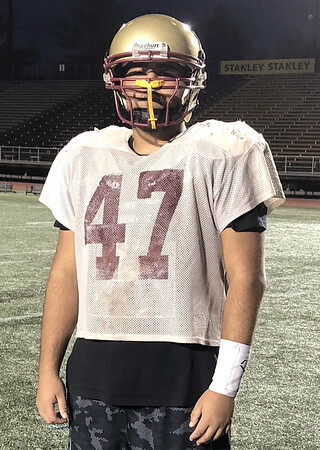 The New Britain senior wants to be known for what he does on the field. For Hernandez, there isn’t much like football. He loves almost everything about it: the physicality, the team aspect, the work. But there was a time - a nine-month stretch two and a half years ago - when it looked like Hernandez might not have played football again. It’s why tonight’s game, Senior Night for the Hurricanes, is going to be a special one, and not just because it will be Hernandez’s first varsity start for New Britain. It was Christmas Eve in 2015, and while most families were preparing to open up presents the next day, David Hernandez looked at the doctor at the Connecticut Children’s Hospital and asked the question no parent ever wants to ask: is my child going to die? A little over a month earlier, Armani had been a typical teenager. He was nearing the end of his freshman season at Public Safety Academy in Enfield and seeing some varsity time on the field when a broken arm changed everything. They’re still not sure if the bone in his left arm had snapped from hitting the turf or if had already been broken, but when it didn’t heal after four weeks in an air cast, the Hernandez’s were sent to a specialist two days before Christmas. The initial thought was it might be an infection, but a biopsy was ordered for the next day just to make sure it was nothing too serious. It turned out to be the one word no one wants to hear: Cancer. A tumor was discovered on his forearm and was diagnosed as Osteosarcoma - bone cancer. If there was good news, it was the doctors had caught the cancer early enough to where it could still be contained to his arm. It wasn’t much longer after that Armani began his rounds of chemotherapy, which came in two types: a lighter dosage and a heavier one. Soon, the chemotherapy - both the good and the bad - started to take its effect. His hair fell out. Sometimes it made him not want to eat for days and Armani went from 238 pounds down to 182. The chemotherapy also made him a little edgy. He didn’t want to be around people all the time and wanted to be left alone for most of the time he was in the hospital. Part of Armani’s ulna bone - the one running from the elbow to the pinkie and where the cancer was discovered - was removed as well. All that’s there now is bone and tissue. For nine months, the weekly cycles of chemotherapy went on with each day bringing on either a new up or down. The midway point was the hardest, having come off another round of the heavy chemotherapy. That day, which had come after a tough road, came in late August, when the doctors told the Hernandez’s the news they had been waiting for so long to hear. The cancer was in remission. The remission also meant Armani could participate in sports again. Football, though, looked like it might be a thing of the past. But after some coaxing from his cousin, Armani began working out, trying to get back into playing shape and size. It led him to joining the New Britain football team this season where, although he hasn’t seen the field, he has become the go-to guy the coaching staff has relied on in practice. That’s what is going to make tonight that much sweeter for the senior, who goes out to practice every day just to play football. Posted in New Britain Herald, New Britain on Thursday, 8 November 2018 20:27. Updated: Friday, 15 February 2019 15:58.